We finally met up: my girlfriend Gail after many weeks of her travelling with her boys for lacrosse tournaments and me travelling with my daughter for softball tournaments. 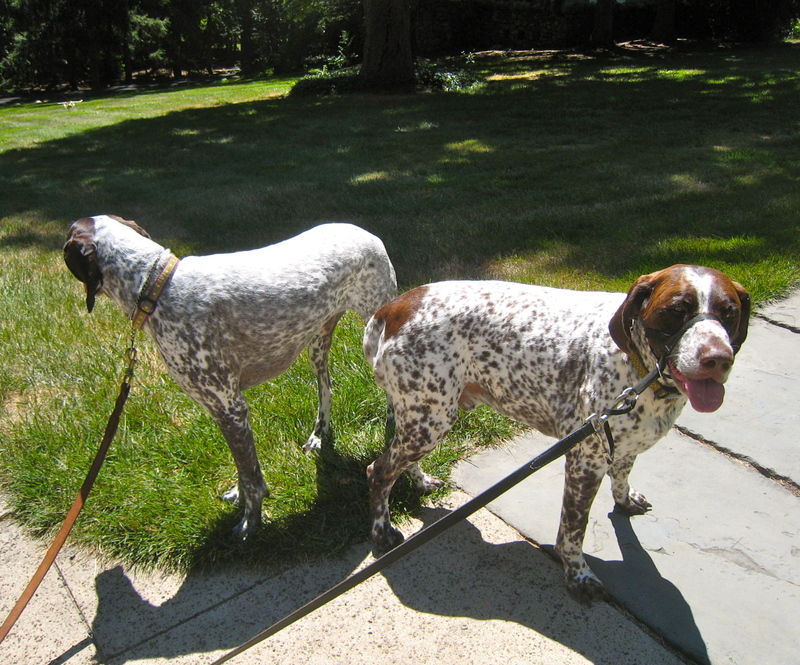 We took Gail’s two lively German short-haired pointers for a walk and caught up on our lives. Looking at their mistress and waiting for the "go" signal. 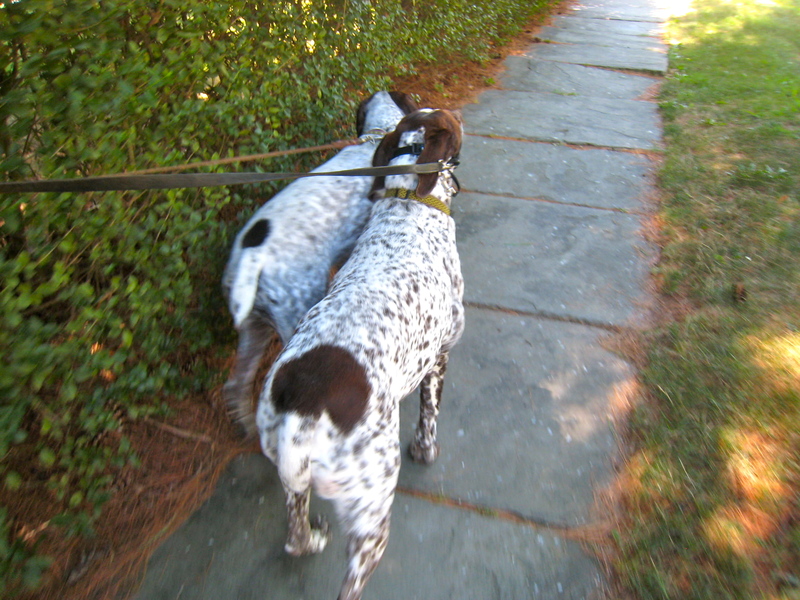 When we left the house, both dogs were straining at their leashes, eager to be off. 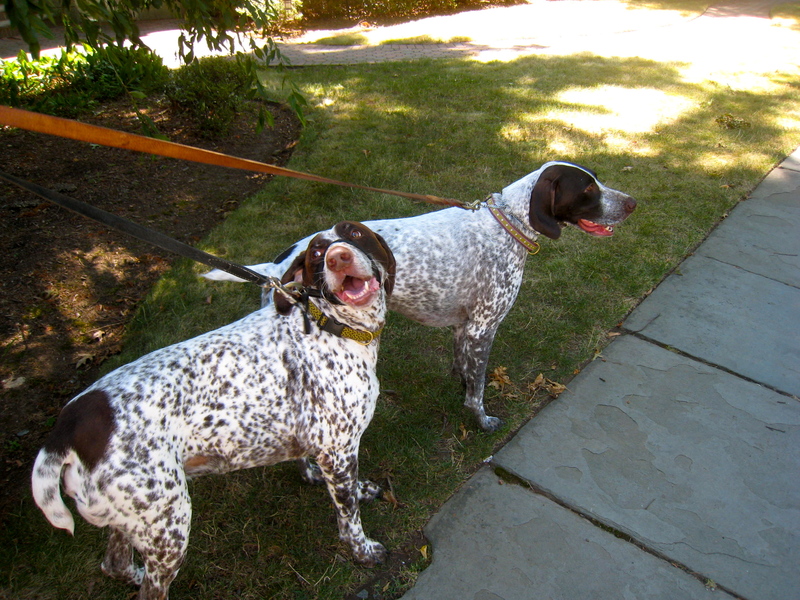 Billy Jean wears a chain collar and Cooper wears a collar that has a leather piece that wraps around his muzzle. No matter to them what they were wearing as both dogs took off at a rapid pace with Gail and I trotting behind them. 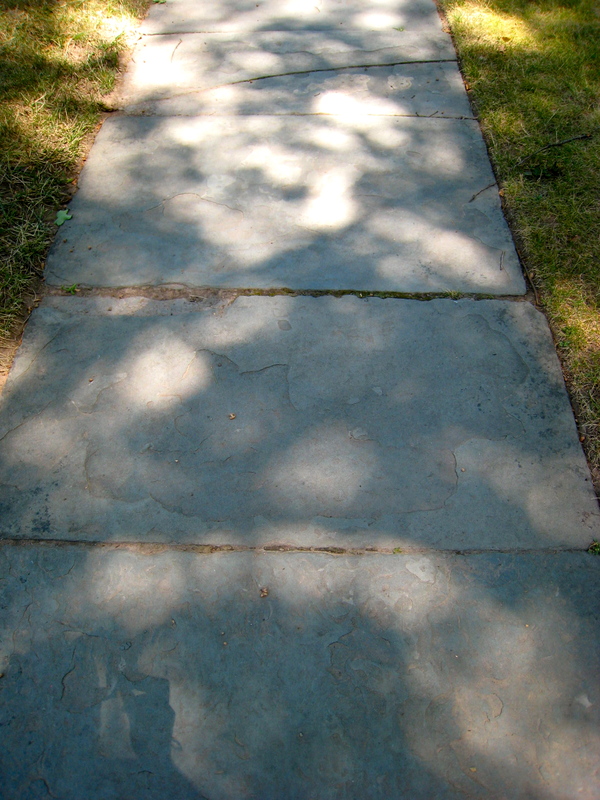 With tails up and noses twitching the dogs trotted down the sidewalk. The dogs were polite and well behaved passing the nanny and child. They graciously moved off the sidewalk to allow a nanny and her charge to roll on by. I'm thinking it was a good thing we were on the opposite side of the road from the landscaper. Just saying. The hat must have been old news to the doggy duo. 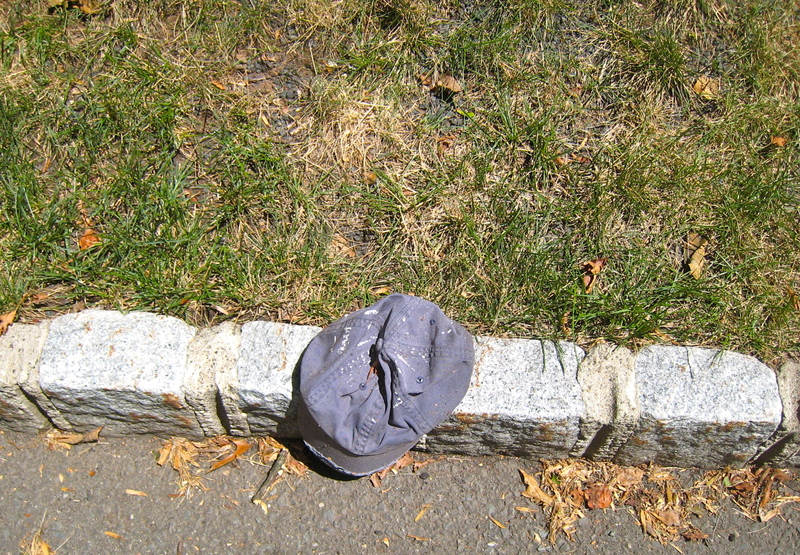 As we trotted along Cooper and Billy Jean passed a hat abandoned on the side of the road; however, they spared it nary a glance as they were intent on something (what? what?) down a nearby driveway. Well behaved or just tired out? As we walked along and Gail and I chatted on, the dogs willingly slowed and stopped as Gail tied her shoe or spoke to a neighbor. By the time we circled back to the house more than an hour had passed and the dogs were tired. Cooper, the older male pointer, has been Gail’s loyal companion for years; he’s a big, husky dog who will gaze soulfully into your eyes then steal a half sandwich from the edge of your plate as soon as you blink. He loves to carry his toys around, hoping to entice you into a game of tug of war, which, trust me, he always wins. In short, he’s a burly, loveable dog who can send you spinning with one thump of his tail. 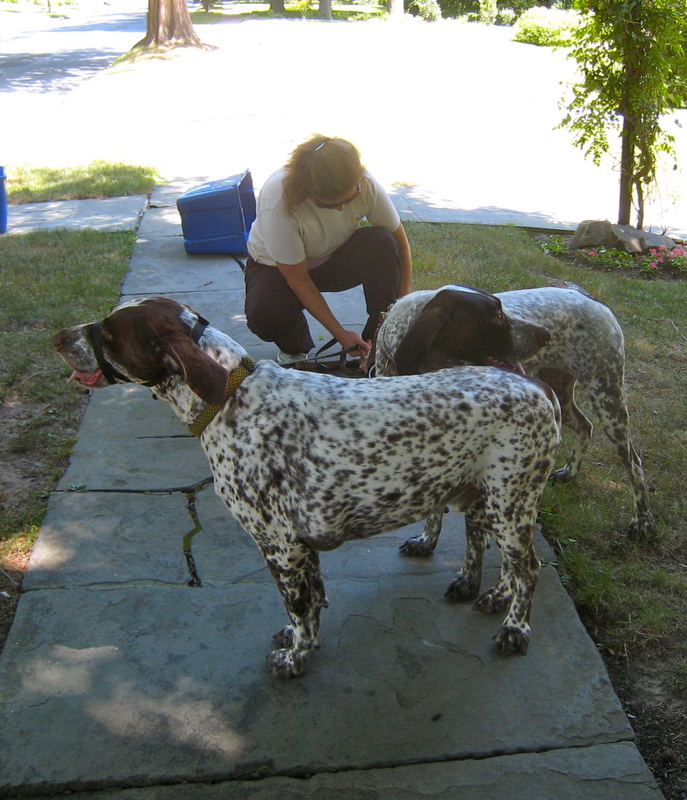 Gail brought home a cute little (relative term considering how big these dogs get) female German short-haired pointer named Billy Jean (and, no, we don’t shorten her name to BJ!) a little over a year ago to keep Cooper company. Billy Jean, after a fretful start to her life, has blossomed into a real beauty under Gail’s care. She is bouncy and fun, fun, fun! The two dogs live la vida loca at Gail’s. Billy Jean on the left and Cooper on the right. Have you tried to get two dogs to look at you at the same time?! Tough!! Walking with Gail and her loyal canine companions almost made me want a dog of my own. Mike? Mike? I’m just kidding. . .I think. Oh don’t kid about having one of us! If you think you might beleive me you would. Just visit someone who has a litter of German Short-Hair pups or Golden Retriever puppies like I was. I bet you’ll leave with one. You’ll never regret it.